In the third semester of the MDM program, students can decide to pitch an idea for their own project they would like to work on and spend 13 weeks bringing that idea to fruition. For many these students, it’s the first time they get the experience of working on their own to determine whether or not their idea would be viable as a product in the real world. Some of them decide to develop the product further in the fourth semester, where they are accredited with a “venture” internship working on their product for an additional 13 weeks. We talked to Angela Hamilton of Quupe, a team currently doing venture internships but also transitioning from a pitch project to a start-up. Quupe is a shared-economy platform for people to rent cool things from their neighbours. Kayaks, power washers, and so on. The idea is to allow people to get value from things they have just sitting around. And on the flip side, for people to be able to try something new (like kayaking) without spending a lot of money buying new equipment they might only use once. Who is involved in Quupe? Our four founders are from the tenth cohort of the CDM. We’re very excited we met in the program and get to continue working together. We’re also working with another C10, a great team of interns from BCIT, and some pretty amazing advisors. How do you plan on transitioning from a student pitched project to full scale business? We’re in the process! I’m learning this is just a one-foot-in-front-of-the-other kind of thing. We’ve gone from thinking of ourselves as students working on a project to people bootstrapping and trying to start a company. I think naming our titles helped with that, as did incorporation. As far as a full-scale business in the “generates money so we can eat” sense, there are many steps on that path still ahead of us, but I think just getting the platform into people's’ hands will help tremendously. We’ve got a number of ideas around how to go about that. The most important thing to me is for us to grow organically, build solid relationships with our early users, and solicit feedback from them all the time around how to make Quupe better serve them. What are some milestones in the immediate future? Well, we’re heading to Lisbon, Portugal next week for Web Summit, where we’ll be presenting as part of their Pitch competition. We’re pretty excited for that. After that, we’ll head back to Vancouver to prepare for the beta launch of our app in January. We’ve also just started working with Wavefront Accelerator here in Vancouver, so we are very excited to continue that work when we get home. Why are you going to WebSummit? We know these conferences are what you make of them. Since we got a generous grant from the CDM that was to be used for travel to a tech conference, we thought it made sense to try for one of the biggest events worldwide. I imagine we’ll learn a lot about what to do — and also what not to do — just from watching other companies and talking to the attendees and people who would be our customers. Obviously, we’ll also be looking to say our name to investors, but for me that’s kind of a secondary reason for going. Of course there are the wild success stories that come out of these kinds of events, but I think at such a huge conference, the likelihood of connecting with a perfect-fit investor is pretty low, just looking at numbers. I’ve always liked the idea of taking vacations that are working vacations (volunteer or otherwise), so that’s how we’re approaching this. We get to spend time together in a cool city, and also we get to float our business past people who don’t know us and haven’t heard of us and wouldn’t otherwise hear of us. I think it’s going to be really valuable. Where do you see this business in a year? Wild success and profit! But in less hyperbolic terms, I hope we’ll be looking at a rapidly growing platform full of happy customers here in Vancouver and that we’re starting to explore our second launch city. It’s tricky to start a two-sided marketplace, especially for first-time startups, but I think we have enough great advisors and people telling us their experiences that we’ve got a decent plan for how to get it done. But it feels like, at the end of the day, it's still a roll of the dice. You can make your plans and line everything up just so, but we won’t really know if we have something until probably well after people start using it. I really hope we succeed at this. I mean, obviously, but -- when I talk to people at events, the response is often immediate and quite emotionally attuned: They get it, and they see (and articulate to me) with precision how it would directly affect their lives for the better. That’s been true whether they see themselves as more of a borrower or more of a lender. So that’s been really gratifying. Research shows that people are growing more and more comfortable with the shared economy after the success of platforms like Uber and AirBNB, and participation is just expected to keep increasing. I think people want something like Quupe to exist, or at least they say they do. So now we just have to hope that goodwill translates into people actually using our platform. The cliché I’ve heard is that a lot of new businesses go around talking about how they want to change the world, but I think someone will actually do that with this concept. It’s just a matter of who hits it right and at the right time. Is the market ready now? I hope so. But I guess that’s part of what we’re going to Lisbon to find out. The CDM provides support for students to help further develop their ideas to potential companies/products, and numerous grads have successfully started up their own companies in the past including NearTuit, H+ technologies, V7 Entertainment as well as Walkies, which is another pitch project from the same C10 cohort. 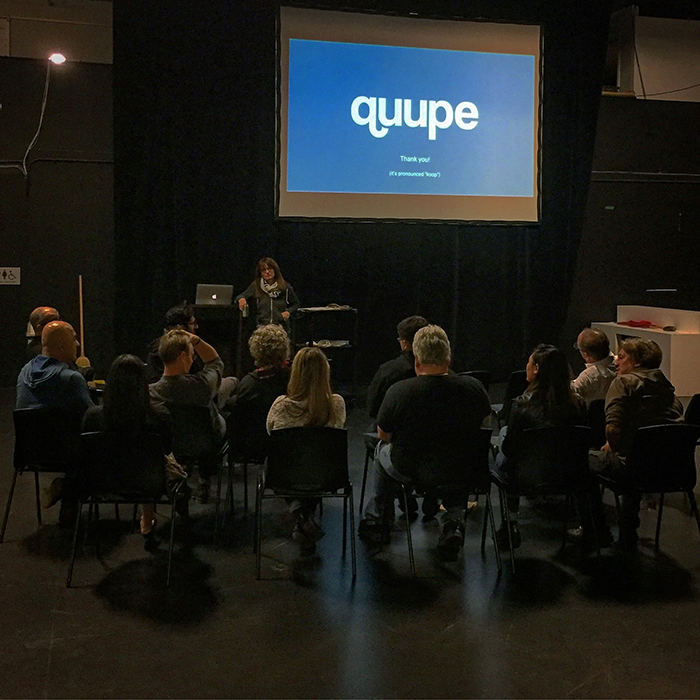 Follow Quupe on their journey from pitch project to start-up on their website and twitter.